Getting caught in a rip current is a scary moment, no matter how well you can swim or how many times you have been in the ocean. According to the NOAA, 100 people drown in rip currents every year in the United States alone. People caught in rip currents account for more than 80% of all lifeguard rescues. Rip currents can occur in any large body of water, even the Great Lakes! A rip current is a fast-moving current of water that moves from the shore out to sea. They can be narrow, or hundreds of yards wide, depending on the conditions. If you are caught in a rip current, it will pull you out to sea, but not underwater. That is why floating and/or staying calm is imperative to your survival. You can always see a rip current from shore, right? No, not always. You can look for signs, such as churning water, murky water, or excess foam or seaweed. If most of the water has normal waves rolling in and the water is clear, but there is a section that appears darker, or the waves are choppier, chances are the latter area is indeed a rip current. I’m pretty much the best swimmer. Ever. I’ll be fine…right? Wrong. A rip current would give Michael Phelps a run for his money. Some rip currents have been recorded moving at speeds of eight feet per second! Just as fast as you got into a rip current, you can get out of it, but the shear speed of the water might alarm you. As difficult as it may seem, don’t panic! Forget this, I am never going in the ocean again! Woah, woah, woah! Don’t be like that. You can go into the ocean, but don’t go into the ocean when A) a large storm, especially a tropical storm or hurricane is coming or going B) if other people are getting rescued by lifeguards due to a rip current, or C) there are red, “no swimming” flags flying along the shoreline and/or at the lifeguard stand. OMG I DIDN’T LISTEN, I AM STUCK IN A RIP CURRENT! DO NOT try to swim towards shore. You will be swimming against the current, and that will exhaust your energy. Instead, swim out of the current, parallel to the shore. Once you are out of the current, you can then swim into shore. If you cannot get out of the current, tread water, or float. (Floating will conserve the most energy.) Eventually, you will be out of the current, and then you can swim to shore. Don’t be afraid by how far offshore you may seem to be. If you absolutely cannot get out of the rip current, face the shoreline, yell, and wave your arms to get the attention of a lifeguard. Do not panic. Do not think about how you just watched Jaws. Think happy, peaceful thoughts. Phew, I made it out! 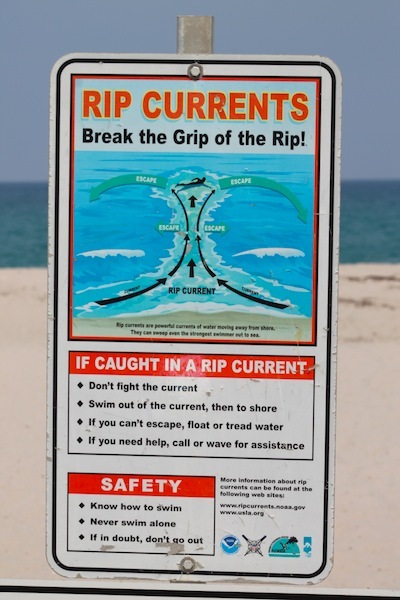 So what should I do next time to prevent getting caught in a rip current? Check your local weather or a weather app. It will say if there is a rip current warning, and where. It is best to avoid that area. Swim where there are lifeguards present. It is nice to have someone watching over you who has been trained and knows the proper procedures, and CPR if necessary. If you think there might be a rip current, ask the on-duty lifeguard to see if he or she agrees, and what their recommendations are. Wearing polarized sunglasses may help to see the differences between the regular water, and the rip currents. If someone else is in trouble, call 9-1-1 or run to a lifeguard. 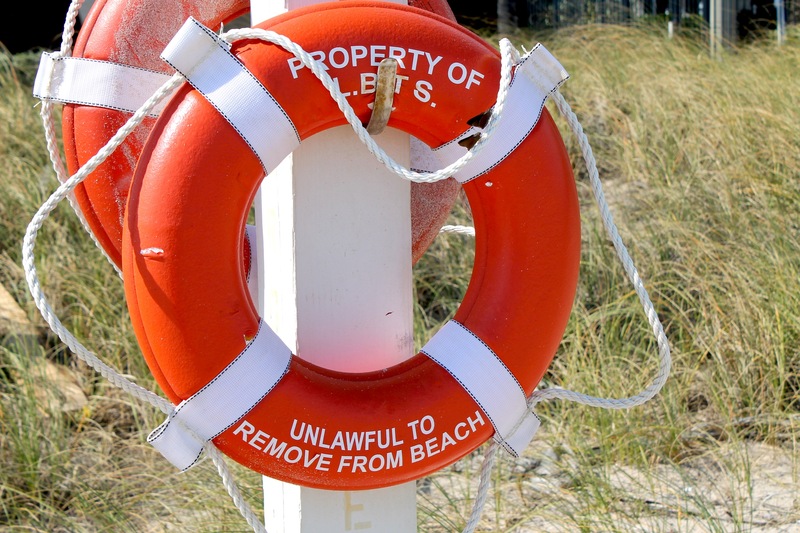 Even in unguarded areas, there may be a buoy that you can throw to the person in trouble. If you go after the person, you may become caught in the rip current yourself, putting you both in jeopardy.